Does this speaker setup break new ground? A speaker system to fall in 'loeuf' with? 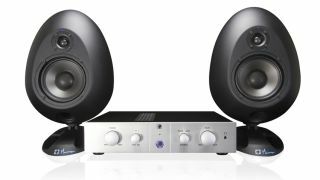 Our five-star review of sE Munro's original Egg150 monitors should be enough to tell you how highly we rate them, but now new speaker brand Munro Sonic is seeking to make some improvements. The Egg150 'Active Monitoring System' comprises not only the speakers but also a separate control unit and amplifier that's matched to the Egg drive units. This features source select inputs, active analogue crossovers, LF and HF trim pot EQ for location setup, and a redefined, three-position, mid-band control switch to emulate the mid-range response of both hi-fi and NS10-type speakers. You can find out more on the Munro Sonic website. The Egg150 Active Monitoring System is available now priced at £2399/$2999.